Joseph L. Mankiewicz’s All About Eve is one of the greatest films ever made, if you’ve seen some kind of list purporting to contain all of the greatest films of all time and it doesn’t have All About Eve somewhere up near the top, then it’s just plain wrong. Yes, I’m looking at you Sight & Sound Critics Poll… Anyway, All About Eve is a ferociously witty backstage drama with a perfect and endlessly quotable screenplay, as well as iconic performances from Bette Davis and George Sanders. The basic premise of the film is that one evening Broadway star Margo Channing (Bette Davis) and her close knit group of theater friends meet Eve, a mousy, but obsessive fan of Margo. Eve soon becomes a part of the group, growing in confidence and making plans for her own career on the stage, however, Eve’s actions begin to drive the friends apart. Taken under the wing of Machiavellian theater critic Addison DeWitt, Eve is able to become a star, but ultimately on his terms. Although I tend to take the Oscars with a grain of salt, they do tell an interesting story with All About Eve. Apart from winning Best Picture and five other awards, the fourteen nominations that All About Eve received has only ever been equalled by one other film. 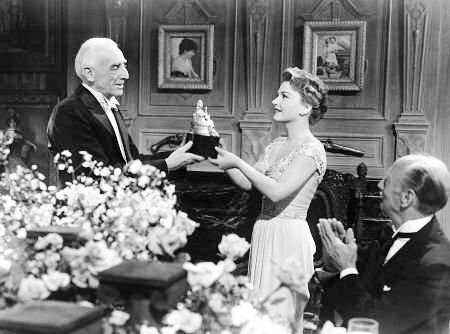 The most notable of these are the four nominations All About Eve received for its actresses (Bette Davis, Anne Baxter, Thelma Ritter and Celeste Holm), a record that is unlikely to ever be equalled for numerous reasons that I won’t go into here, however much of this comes down to just how well Joseph L. Mankiewicz directed and wrote for women. Mankiewicz once said “Performing women, I won’t stop being fascinated and terrified by them; I won’t stop thinking and learning and writing about them until I die”. The fact that with A Letter To Three Wives (1949) and All About Eve (1950) he won back to back Best Director and Best Screenplay Oscars for two films that were ostensibly about relationships between women goes some way to underscore just how well he did this. When discussing All About Eve it is all too easy to fall into the trap of endlessly quoting Mankiewicz’s incredibly witty dialogue or simply fawning over the peerless performances of Bette Davis and George Sanders. However, when you consider that this is a movie called “All About Eve“, which is essentially the story told via flashback of how Eve manipulates all around her to become a star, it’s strange that you rarely hear her mentioned when people discuss the film. A lot of this comes down to just how larger than life Bette Davis (and indeed, Margo Channing) is, the aptly named Addison DeWitt’s acid wit, the magnificent set piece that is Bill’s party, Marilyn Monroe’s early and perfect casting as Miss Casswell (“Why do they always look like unhappy rabbits?”) and Bette Davis and Gary Merrill’s booze filled romance both on and off screen. 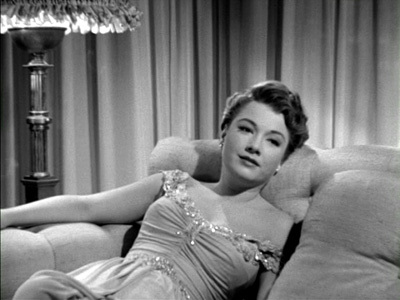 However, I think the main reason that discussions of All About Eve are rarely all about Eve is a result of the perfect combination of Anne Baxter’s flawless performance and Mankiewicz’s precise screenwriting of Eve as a dead-eyed shark. While the other more flamboyant characters party and trade witty asides, Eve Harrington slowly circles with fierce, focussed determination looking for any sign of weakness to strike. Yet unlike the others, when she strikes it isn’t with a witty aside or put down, it is with the opportunistic intent of the “killer” that Addison DeWitt so aptly dubs her. We are introduced into the world of All About Eve through Addison DeWitt’s sublime voiceover providing cynical snapshots of each of the major characters following an appropriately grandiose description of himself: “To those of you who do not read, attend the theater, listen to unsponsored radio programs or know anything of the world in which you live – it is perhaps necessary to introduce myself. My name is Addison De Witt. My native habitat is the theater. In it, I toil not, neither do I spin. I am a critic and commentator. I am essential to the theater”. This is probably as good a time as any to address the first of the two elephants in the room here (noting that I will briefly mention the second one later and then try to hide it behind the couch or something), why have I decided that Eve Harrington is the villain of All About Eve and not Addison DeWitt? Well… This is a very good question and thanks for asking. Yes, it’s true that whatever outcomes Addison DeWitt wants throughout the film he gets and ultimately he ends up with complete control over Eve and her career. However, it is important to note that his role is as exactly he describes in the introduction: “I toil not, neither do I spin. I am a critic and commentator. I am essential to the theater”. While ever ready with witty asides and the appropriate commentary for the viewers or his readers, he always sits just outside the action observing any conflict. Addison also acts as something between a mentor and an enabler for both Miss Caswell and Eve, observing them closely and giving their careers a nudge here and there as required, at times seemingly for his own amusement. It is also important to note that throughout the film he never shows malice toward the other characters, contempt, sure… but never malice. Without doubt Addison DeWitt is the smartest person in the room, probably any room he enters, and as a result he is the best person to guide us through the narrative. If he pushes a few buttons here and there for his own amusement or personal gain, well, who are we to argue? We are taken back to the beginning of Eve’s story by Karen Richards’ (Celeste Holm) recollection of the night when she invited Eve, who she had noticed night after night waiting by the stage door, backstage to meet her hero Margo Channing. Before allowing her in, Margo notes that she had also observed “the mousy one with the trench coat and a funny hat” after every performance waiting for a chance to catch a glimpse of her. It is impossible 66 years after this film was made to watch this obsessive fan lurking alone in the shadows waiting to see her idol and not think about stalkers or other dangerous obsessives such as John Hinckley Jr obsessed with fame. However, Eve’s combination of apparent innocence, flattery (“I’ve seen every performance…I’d like anything Miss Channing played in…I think that part of Miss Channing’s greatness lies in her ability to pick the best plays.”) and the sad tale she tells of her life makes her an object of both sympathy and fascination for the group and Margo immediately takes her under her wing. I always find it an interesting character point that there is only one person at this stage who isn’t taken in by Eve. Margo’s assistant Birdie (played by the incomparable Thelma Ritter) laughs off Eve’s tale of woe with “What a story. Everything but the bloodhounds snapping at her rear end”, before unconvincingly apologising for the comment. At the point where Margo begins to mistrust Eve, Birdie will be the one to explain to her that Eve is “studying you, like you was a play or a book or a set of blueprints – how you walk, talk, eat, think, sleep…” words which Margo herself will later use to explain her contempt for Eve.The only other person in the film who immediately sees through Eve is the aforementioned “smartest person in the room” Addison DeWitt. Of course. When I noted earlier that Eve is “a complete psychopath” it wasn’t entirely a flippant comment. Eve’s almost textbook psychopathology is so precise that it’s hard not to wonder whether it was intentionally drawn out by Mankiewicz from bits and pieces of psychological studies or whether he simply wrote a character with precisely these traits to fit the narrative. 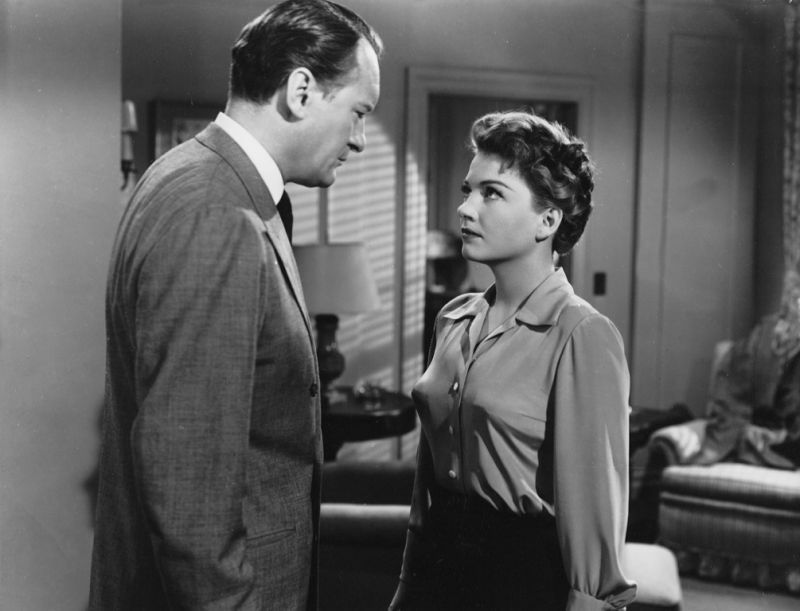 Given that such psychological research was somewhat less advanced in 1950 and that I have seen Mankiewicz quoted as saying that “The most virulent Eve I’ve ever known was the production head of a major studio”, my assumption is that Eve was based on the traits of various borderline personalities that he had worked within the film industry. Your score from primary psychopathy has been calculated as 4.9 [out of 5]. Primary psychopathy is the affective aspects of psychopathy; a lack of empathy for other people and tolerance for antisocial orientations. Your score from secondary psychopathy has been calculated as 4 [out of 5]. Secondary psychopathy is the antisocial aspects of psychopathy; rule breaking and a lack of effort towards socially rewarded behavior. The behavioural questions in the counseling-office.com “Psychopath Test” provide a fascinating filter through which to watch the character of Eve Harrington develop throughout the film. When she first meets Margo and is the centre of attention, telling her (largely fictional) life story she is “deceptive, unscrupulous, underhanded, manipulative, and dishonest” (#3), while able to fulfil the need to “feel good in a group of people, needing attention – just listening for long time makes her feel uncomfortable” (#34). During this exchange, “In her speech, she emphasizes emotions and impression over detail” (#35) with numerous relatively meaningless statements such as “But somehow, acting and make believe began to fill up my life more and more. It got so I couldn’t tell the real from the unreal. Except that the unreal seemed more real to me”, as well as her contact with her idol Margo, enabling her to support her feelings of being “special and unique… associating with people of similar status as only they can fully understand her” (#24). As Eve spends more time with Margo, the effect of “Certain circumstances or people having a strong influence on her, to the extent that she changes her plans or goals” (#40) becomes apparent and as she stands on stage with Margo’s costume bowing to the empty stalls we see her “fantasizing about unlimited success, power, brilliance, beauty” (#23). Her personality type which “tends to dramatize and exaggerate her display of emotions and can be quite theatrical” (#39) and is “hungry for excitement and good entertainment, and loves situations where she’s the center of attention” (#42) is perfectly suited to acting, particularly given her idealised view of the theater being a place where “If nothing else, there’s applause… like waves of love pouring over the footlights”, which provides the opportunity for the “Admiration that she can never get enough of. At times, actively looking out for it and feeling bad if she doesn’t receive it” (#25). As the film progresses we see numerous other examples of Eve’s psychopathy. The portrayal of her use of sexuality, apart from being unexpectedly frank for a film made during the peak of the Hays Code, displays numerous borderline characteristics. Her attempted seduction of Bill (“Don’t cry, Just score it as an incomplete forward pass”) and more successful seduction of Lloyd are “interactions with others that have a sexually seductive or provocative undertone (some might see it as inappropriate)” (#35). Throughout the film she can be seen to “have many brief relations and affairs, and her choice in sexual partners can be very indiscriminate depending on her mood and chances. She can have several relationships at the same time – and isn’t shy to talk about my ‘sexual conquests’. When she feels the urge to do so, she can act very enticing and convincing to ‘coerce’ others into sexual activity” (#19), her sexual relationship with Lloyd begins with the assistance of a woman who has the appearance of her lover calling Lloyd in the middle of the night pleading with him to visit Eve. When she next see Addison, she is boasting that “He’s going to leave Karen. We’re going to be married…Lloyd loves me, I love him…I’m in love with Lloyd…”. However, Eve’s seduction of Lloyd is more about what she can get out of it rather than any genuine feeling of love “Oh Addison, won’t it be just perfect? Lloyd and I – there’s no telling how far we can go. He’ll write great plays for me, I’ll make them great”, something that Addison immediately sees through. Nowhere in the film is Eve’s manipulation more brutal than in her treatment of Karen. It is through Karen’s kindness that Eve is first introduced to Margo and the world of the theater, something for which Eve feels no sense of gratitude. 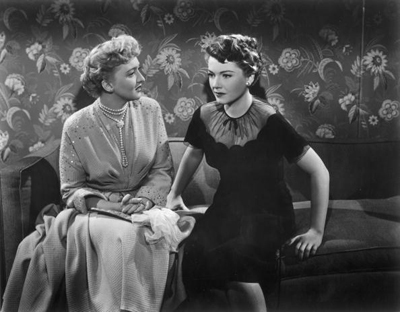 Eve increasingly takes advantage of Karen throughout the film, firstly by persuading her to influence the decision to make Eve Margo’s understudy, then through the exploitation of Karen’s kind hearted, but obviously idiotic, gesture to make Margo miss her train so Eve can take the stage. Rather than being grateful for this help, Eve then uses it as leverage to blackmail Karen to lobby for Eve to get a part in Lloyd’s new play. Eve’s final betrayal of Karen is to seduce her husband and attempt to end her marriage. OK. It’s probably time to address the other elephant in the room here. Yes, Eve manipulated everyone. Yes, Eve lied about everything. Yes, Eve is a psychopath… But Eve is a great actress. She receives only the highest praise from all who see her perform and ultimately wins the Sarah Siddons Award as a result of her acting and not through any of her other less desirable talents. Eve’s acting skills are thrown into even sharper relief when compared to Addison’s other protégé Miss Casswell, whose attempt to audition for Max ostensibly consisted of her rushing to the bathroom and vomiting. So, yes, Eve is the villain of this story and she does manipulate her way to the top through deception and borderline behaviour. However, she does ultimately appear to deserve to be there. As this is a 1950s film, there is, of course, the expectation that the villain will eventually be bested by the hero… However, things are a little bit murkier in the case of All About Eve, it’s more the Man In Grey rather than the Man In White who defeats Eve. Addison DeWitt’s almost omniscient understanding of all that has come before is made immediately clear as he asks the haughty Eve “Is it possible, even conceivable, that you’ve confused me with that gang of backward children you play tricks on, that you have the same contempt for me as you have for them?”. At the moment that Eve believes that all of her plans have come to fruition, having guaranteed her stardom with a stellar role and a future of great roles with her plans to marry the greatest playwright in America, Addison DeWitt brings her thudding back to earth with his revelations of her clumsy collection of lies and her, or more correctly Gertrude Slojinski’s, shady past that she has tried to hide. By the end of this exchange Addison has claimed control of Eve’s career and her life, proving his earlier statement to her “I am Addison DeWitt. I am nobody’s fool, least of all yours”. 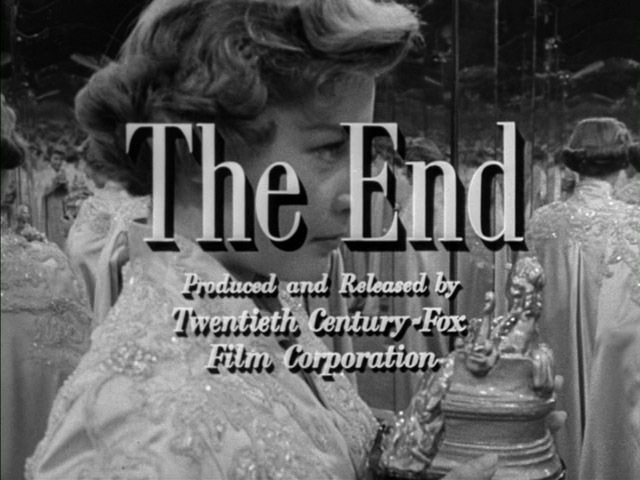 The ending of All About Eve could not be more perfect. After Eve’s great victory, where the Sarah Siddons Award gives her all of the praise and recognition that someone with her condition would expect, “she exaggerates her achievements and talents. Expecting people to show respect or even accept her as superior, regardless of having commensurate achievements or not” (#22), Eve is startled by her very own Eve. Phoebe (Barbara Bates) is only in the film for a single scene, but it is her image that we see reflected to infinity as the film ends. Addison instantly recognises that Phoebe, like Eve, is lying about her name and probably everything else and that Eve has been taken in by her. His amusement and uncanny ability to spot talent leaves little doubt that when the time comes, he will happily give Phoebe the mentoring or whatever nudge she needs to become a star. As the film ends with Phoebe taking in the image of herself in Eve’s gown holding Eve’s award, just as Eve had done with Margo’s costume at the theater, we know that Eve may well have met her successor. 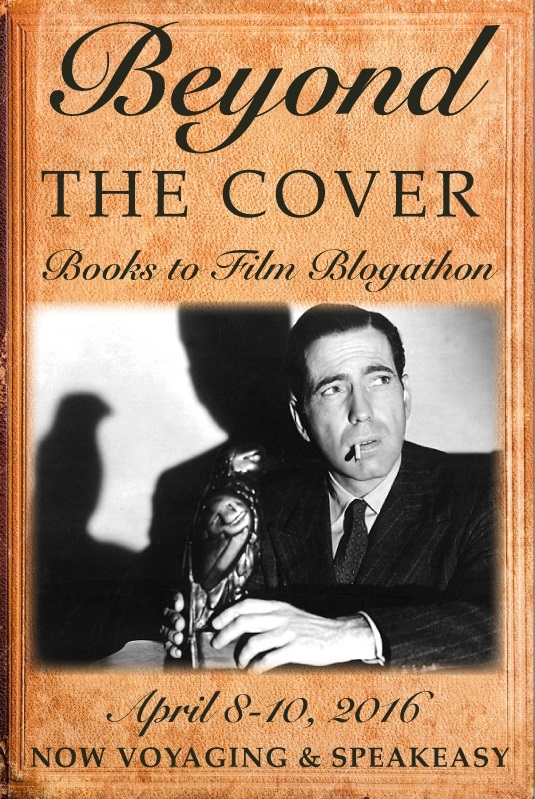 This post is part of The Great Villain Blogathon hosted by Speakeasy, Silver Screenings and Shadows and Satin. To discover more about the Blogathon and check out other posts, click on the picture of The Woman From The City below. Great post. You have captured Eve so well. Not only a great director, Manckiewicz showed what a skilled writer he was. All About Eve and A Letter to Three Wives are surely his two best films. 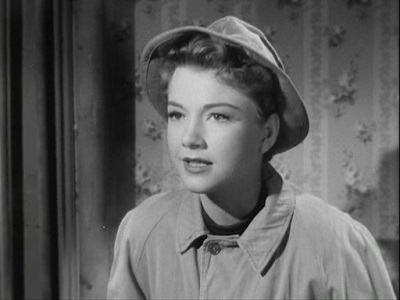 Anne Baxter ‘s best role too. Thanks and completely agree with you that those were his greatest films. I do also love The Ghost And Mrs Muir, but he isn’t listed as screenwriter (although I suspect he may have made quite a few changes to the screenplay he was given). Loved this look at All about Eve. I hadn’t really thought about Eve being evil, but your description of her as a cold-eyed shark-that’s her in a nutshell! Great post!! Fantastic post! Here in Brazil, the film’s title is “The Evil One”, and we frequently see people referring to Margo as the evil character in the film – totally wrong! I see Eve is the real evil force, but with your article I could see that Addison and Eve were the real evil duo – and I doubt they would be successful without each other’s help. Eve Harrington is a great choice for a villain. I loved reading your article. “All About Eve” is one of my favorite films. Wonderful work! This was such a treat to read, such a great analysis of the character, performance and writing. 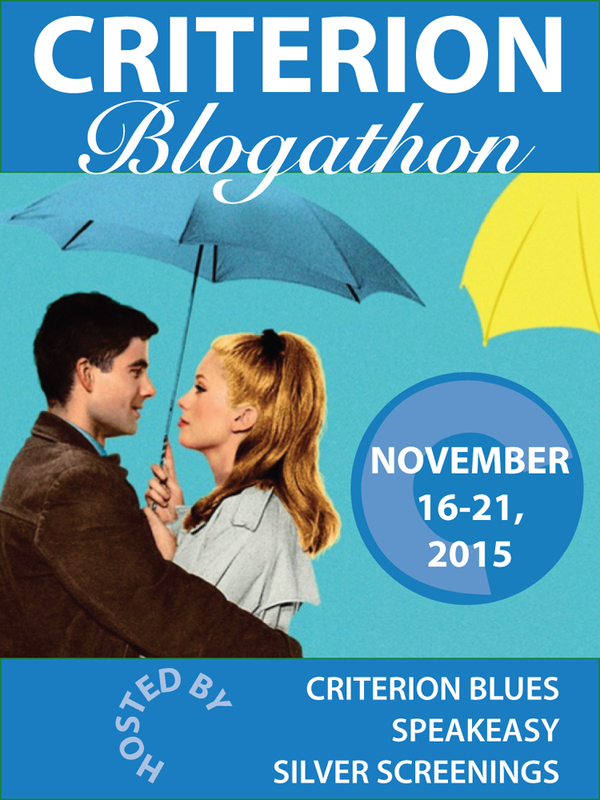 Thanks so much for being apart of this blogathon! 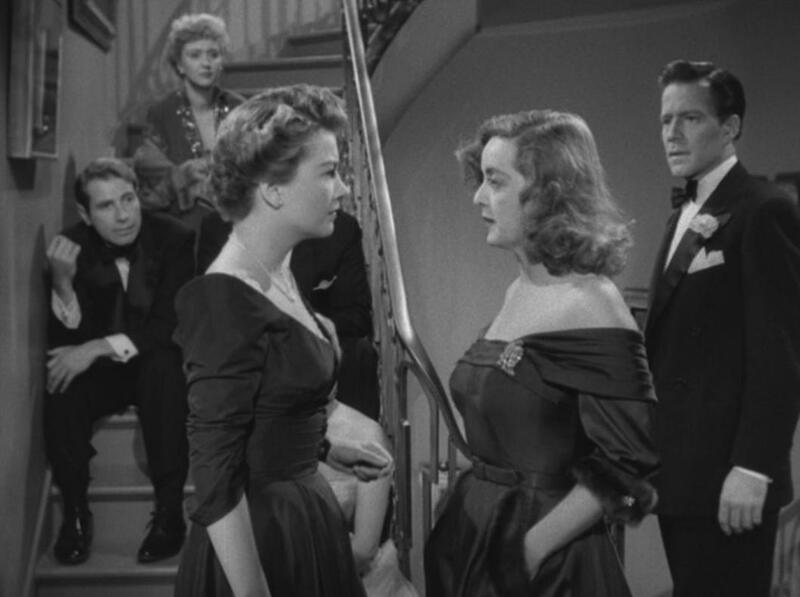 Thanks and thanks for hosting, it was so much fun to find an excuse to watch All About Eve a couple more times and to really think about what makes Eve such an effective villain. Good Point – Eve was a great actress, and because she had talent, she likely deserved the award she received at the beginning of the film. I hadn’t fully appreciated that before. Your analysis of her mental condition is fascinating. Thanks for sharing that research with us! She is exactly as you’ve described her. Thanks for joining the blogathon, and for bringing this spotlight on Eve Harrington! I really enjoyed reading your review of All About Eve. You give very good evidence that Eve is a pychopath. Great analysis of her character overall. It was interesting to read why you chose Eve and not de Witt as the villain. Wonderful post! I just re-read your post, and I enjoyed it just as much the second time. In fact, I might forego my afternoon’s activities to watch this film again, based on your great analysis. Also reminds me that I should watch All About Eve again!